The horrors and atrocities of Second World War paved the way for creating an effective human rights protection mechanism that would prevent such events in the future. In the conflict’s aftermath, on the 21 January 1959 on the basis of Article 19 of the European Convention on Human Rights and Fundamental Freedoms, the European Court of Human Rights was established. The Court has the main function of ensuring the protection of rights and freedoms enshrined in the European Convention. It hears individual, grouped applications or member State’s applications alleging that a contracting state has breached one or more of the human rights provisions concerning civil and political rights set out in the Convention and its protocols. The judgments of the Court are binding. This the Court in brief brochure is an introduction to the Court and the key dates in its history. It gives a short summary of the Convention and its guarantees and prohibitions. 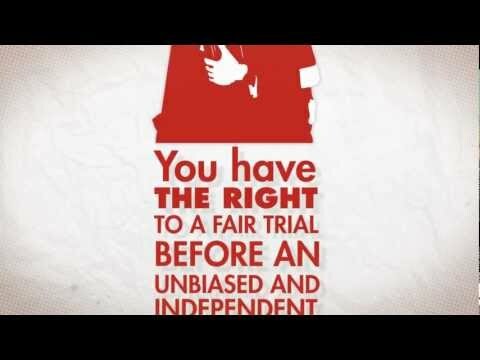 This documentary film is about the Court and shows specific examples of cases examined by the Court and considers its prospects over the forthcoming years and the challenges facing it. The film is currently available in 24 languages. This document is intended to provide general information about the way the European Court of Human Rights works. It refers to a number of questions, such as: when was the European Convention on Human Rights was adopted, which rights are protected by the European Convention, are domestic courts obliged to apply the European Convention, what is the Registry and how it runs, etc is. 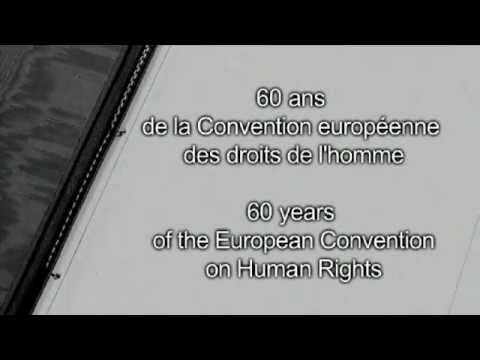 The European Court of Human Rights has produced a short video presenting the main rights and freedoms in the Convention. This video is currently available in 38 languages. This simplified version of selected Articles from the European Convention of Human Rights and its Protocols is included for educational purposes and takes its inspiration from the simplified version of the Universal Declaration of Human Rights produced by Amnesty International. These questions and answers on the European Court of Human Rights have been prepared by the Registry of the Court. The brochure is intended to provide basic general information about the way the Court works. For more detailed information, reference is made to documents issued by the Registry (available on the Court’s website: www. echr.coe.int) and in particular to the Rules of Court. The task of the Registry is to provide legal and administrative support to the Court in the exercise of its judicial functions. It is therefore composed of lawyers, administrative and technical staff and translators. There are currently some 640 staff members of the Registry, 270 lawyers and 370 other support staff (see the Organisation Chart below). The staff members are recruited on the basis of open competitions. All members of the Registry are required to adhere to strict conditions as to their independence and impartiality. The principal function of the Registry is to process and prepare for adjudication applications lodged by individuals with the Court. The Registry’s lawyers are divided into 31 case-processing divisions. The lawyers prepare files and analytical notes for the Judges. They also correspond with the parties on procedural matters. They do not themselves decide cases. In addition to its case-processing divisions, the Registry has other divisions (see the Organisation Chart below). This documentary about the European Court examines how the Court works while taking a closer look at the architecture of the Human Rights Building, designed in 1994 by the British architect Sir Richard Rogers. In 2009, the Court adopted a new policy concerning the order in which it deals with cases. According to this policy, the Court takes into consideration the importance and urgency of the issues raised when deciding the order in which cases are to be dealt with. Thus, the most serious cases and cases which disclose the existence of widespread problems will be dealt with more rapidly. Over the past few years the Court has developed a new procedure to cater for the massive influx of applications concerning similar issues, also known as “systemic or structural issues” – i.e. those that arise from the non-conformity of domestic law with the Convention as regards the exercise of a particular right. The Court has thus recently been implementing a procedure that consists of examining one or more applications of this kind, whilst adjourning its examination of similar cases. When it delivers its judgment in the pilot case, it calls on the Government concerned to bring the domestic legislation into line with the Convention and indicates the general measures to be taken. It will then proceed to dispose of the adjourned similar cases in the light of the terms of the pilot judgment. An amended version of Rule 47 of the Rules of Court, which sets out the conditions for applying to the Court and for lodging a complete and valid application, came into force on 1 January 2016. The changes are described in detail in the press release issued by the Court on 01/12/2015. 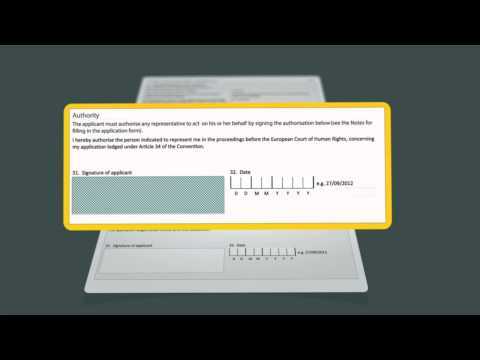 This video clip is a tutorial explaining how the application form must be completed in order to be examined by the Court. Available in 21 languages. Information on grouped applications and multiple applicants can be found in this document. The Practical Guide on Admissibility Criteria describes the conditions of admissibility which an application to the Court must meet. Practitioners and prospective applicants should study this Practical Guide carefully before deciding to bring a case. For more information on the Admissibility Criteria and to know whether, on the face of it, your application satisfies the main admissibility criteria for lodging an application with the Court, follow this link. This video sets out the main conditions required in order to apply to the Court. The video is available in 30 languages. A new application form has been available since 1 January 2016. No other form must be used. The application form should be downloaded, completed, printed out and sent by post to the Court with the necessary documents. Do not contact the Court for a paper copy of the form; printing it yourself will save time and make sure your application reaches the Court in good time. Please note that the application form will work correctly only with Adobe Reader 9 upwards (download available from www.adobe.com). Please save a copy of the form locally before filling it in using Adobe Reader, then print it and post it to the Court. You may write in one of the Court’s official languages (English and French) or in an official language of one of the States that have ratified the Convention. No purpose is served by sending the application form by fax since this will not interrupt the running of the period laid down in the Convention for applying to the Court. Only the original application form sent by post will be considered by the Court. There is no need to come to Strasbourg in person to state your case orally. Your case will not be examined any quicker and you will not receive legal advice. The Registry may ask you for additional documents, information or explanations relating to your complaints. If you do not wish your identity to be disclosed, you must inform the Court immediately, giving reasons. The President will determine whether your request is justified. At this stage of the proceedings you do not have to be represented by a lawyer. If, however, you wish to apply to the Court through a representative, you must complete and sign the appropriate part of the application form. Information you will need before filling in the application form can be found in this document. This document presents the common mistakes in filling in the application form and advises how to avoid them. This information note provides some case-law examples on interim measures’ applicability. Interim measures are granted by the Court only in clearly defined conditions, namely where there is a risk that serious violations of the Convention might occur. A high proportion of requests for interim measures are inappropriate and are therefore refused. Applicants who make a request for an interim measure pursuant to Rule 39 of the Rules of Court should comply with the requirements set out in this information note. The Court has established a dedicated Fax number for sending requests for interim measures: +33 (0)3 88 41 39 00. Please note that failure to use this number may result in your request not being dealt with immediately, especially during holiday periods. For this reason, please use the above number for all correspondence concerning interim measures. Requests must be set out as comprehensively and concisely as possible. However, it is recommended that any faxes exceeding ten pages be sent in several parts so that they can be received and processed in the best possible conditions. Once a request for interim measures has been submitted, the applicant or his or her representative is required to follow it up. In particular, it is essential that the Court is immediately informed of any change in the applicant’s administrative status or other circumstances (for example, if the applicant is granted a residence permit or returns to his or her country of origin). The applicant’s representative must also inform the Court promptly on his or her own initiative of any potential loss of contact with his or her client. The HUDOC database provides access to the case-law of the Court (Grand Chamber, Chamber and Committee judgments, decisions, communicated cases, advisory opinions and legal summaries from the Case-Law Information Note), the European Commission of Human Rights (decisions and reports) and the Committee of Ministers (resolutions). This user manuel (No. 1) explains how to carry out a simple search of the Court’s case-law online. 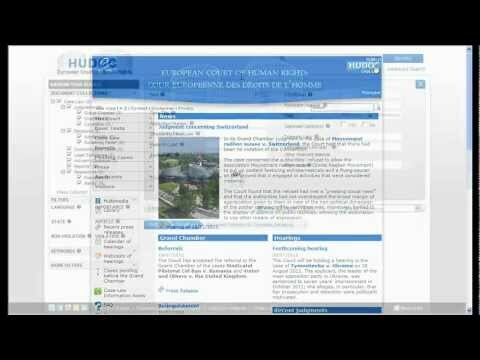 A video showing the main search functions of the HUDOC database was published by the Court. The tutorial explains how to carry out a simple search of the Court's case-law. The HUDOC database provides access to the case-law of the Court (Grand Chamber, Chamber and Committee judgments, decisions, communicated cases, advisory opinions and legal summaries from the Case-Law Information Note), the European Commission of Human Rights (decisions and reports) and the Committee of Ministers (resolutions). This user manuel (No. 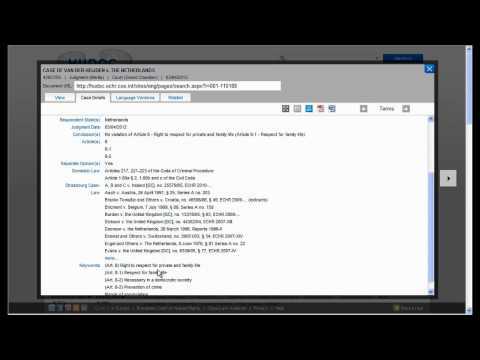 2.2) explains how to carry out a advanced search of the Court’s case-law online. 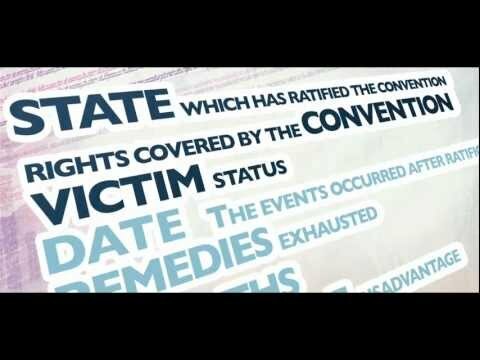 The advanced video explains in detail the functionalities of the database of the Court’s case-law.